Slow cooker Tuscan chicken stew to warm you up on a cold day. Instructions to prepare this chicken stew in the crock pot and a video tutorial so you can’t mess it up! The flavors are enhanced by fennel seeds, rosemary, and a splash of balsamic vinegar. This recipe was updated on 23/10/2017 to include instructions on assembling ahead and freezing. This slow cooker Tuscan chicken stew recipe is inspired by something my mom cooked for us just after Kai was born. I remember looking at this chicken stew and not thinking much of it. But then we dug in (with huge chunks of bread, completely mandatory!) and…holy yum. The potatoes and the chicken and rosemary and THE BREAD…just so delicious, soul-warming and not a drop (or a crumb) were left behind. With that stew as an inspiration, I set out to recreate it in slow cooker form…and this slow cooker Tuscan chicken stew was the result! 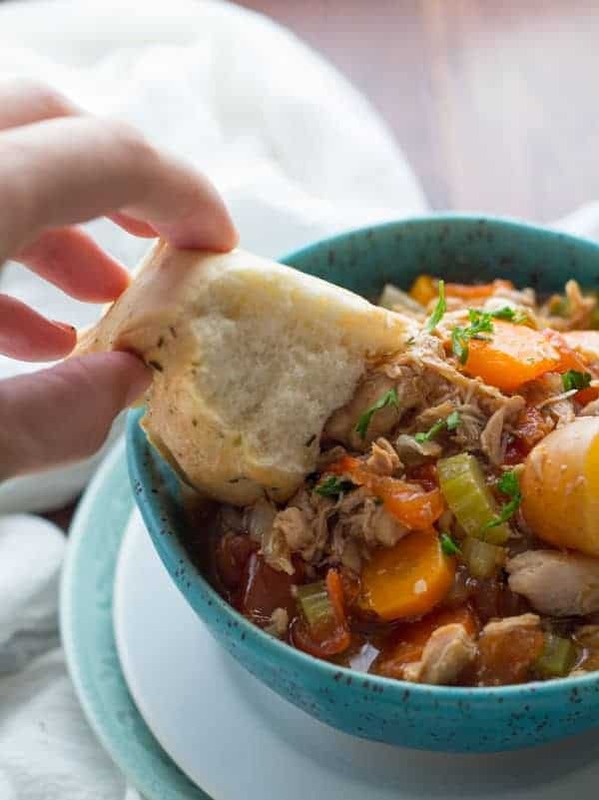 This crock pot chicken stew recipe couldn’t be any easier to prepare: simply dump your ingredients into the slow cooker and cook on low for 4-6 hours. About half an hour before you are ready to serve, you will thicken your stew, and add in a splash of balsamic vinegar. How do you thicken this Tuscan chicken stew? Thickening your stew is optional, but it really helps give it that comfort food texture…velvety and smooth and just a little more substantial than an un-thickened stew. It also helps the delicious broth stick to the chicken, bringing it even more flavor. For this Tuscan chicken stew, I simply mixed a bit of cornstarch with some water, add it to the pot 30 minutes before serving, and turn up the temperature to high. This chicken stew is a great as written but you can totally change it up depending on what you have on hand in your fridge or pantry! Can you believe this slow cooker Tuscan chicken stew actually tastes even better on day 2? It makes for a fabulous lunch the next day. 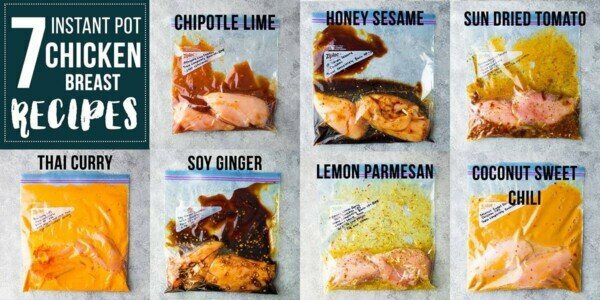 , because you can re-heat them right in the storage container. So convenient for packing stew in your lunch. Can you freeze chicken stew? Yes, you can, although with this particular recipe, you are going to need to re-heat gently, ie: don’t bring it to an all-out boil. Heating and stirring gently will keep the chicken and veggies intact. Watch the video below to see exactly how I prepped my crock pot chicken stew recipe. It’s so easy! You can find more of my recipe videos on my YouTube channel, or on Facebook. More slow cooker stews for us! 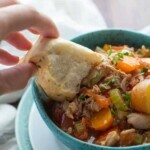 Or check out this round up of 19 Healthy Slow Cooker Soups & Stews! This easy slow cooker recipe simmers chicken, potatoes and rosemary with vegetables for a delicious and flavorful supper. 1 tablespoon tomato paste optional! Toss chicken, carrots, celery, onion, garlic, tomatoes, potatoes, chicken stock, tomato paste, wine, fennel seeds and salt into the slow cooker. Cook on the lowest setting for 4-6 hours. Add the water/cornstarch, balsamic vinegar, and rosemary. Taste and add additional salt if necessary. Turn heat to high, and cook for 10-30 minutes, until slightly thickened. Thaw completely before cooking on low for 5-6 hours (check that potatoes are cooked through). Stir in the water, cornstarch and balsamic vinegar, set to high, and cook for 10-30 minutes, until thickened. Serve with a crusty baguette, or fresh focaccia. I used a 5 quart slow cooker. Find directions to prepare in the Instant Pot in this Instant Pot Tuscan Chicken Stew post! I should add that it is only about 2 hours into cooking so maybe it will come together later, but i doubt it by the looks of it…. Help, my sauce separated for some reason. i think i followed recipe well. i used chicken breasts and they were skinless, boneless and trimmed. Now it looks thin with pink globules in it….should i rinse and make another sauce for all the ingredients? i am really perplexed. Hi Nancy, I’m so sorry but I’ve never heard of this happening? Sometimes things look a little odd when they are cooking but giving them a good stir at the end helps everything come together. How did it turn out in the end?